A second chance at love story and a hockey themed book...this story was made for me. This was a book that I rewarded myself with one Saturday. If I did so much of my real work, then I got to read a couple of chapters from the book. It was GREAT incentive. This book is about Vale and Hawke. They were fully committed to each other from the ages of 16 to 20. They were also fully committed to partying hard and living life to the fullest. Nothing bad could happen to them. 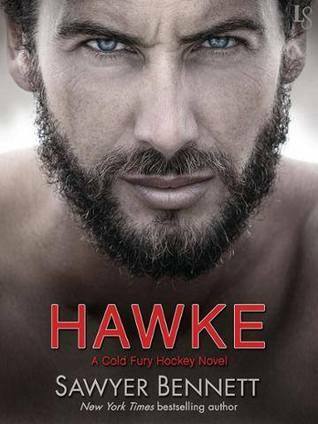 That all came crashing down the night before Hawke had to leave to go play hockey for the NHL...and Vale broke his heart with no explanation. Now they are both working for the Cold Fury. The first time they've seen one another since that night seven years ago. They're older now...wiser, more mature...but that doesn't make those hurt feelings go away. No, they're both still hurt by how it all fell apart, but they can be professionals. There's quite a bit happening in this story. Both Vale and Hawke are settling into new jobs, trying to navigate how to work with one another, and for Vale, she's also dealing with her father's health...the whole reason she's working with the Cold Fury. It's a lot of stress. But Hawke had a relationship with her father, too, so he also gets caught up in all that. I liked how their lives quickly become intertwined that has nothing to do with the thing happening between them. Overall, I enjoyed the story. There's a lot of history between the two and they never lost their passion. There are glimpses throughout the book of the wild kids that they were and I really enjoyed those scenes. They definitely helped me connect to who they are. I also loved the story line thread about Vale's tattoo. It really ramped up those scenes and Hawke's emotions about everything that happened between them. Again, another great installment to this hockey series that I've thoroughly enjoyed. I'm looking forward to Max.